Amidst in the picturesque beauty of Horanadu, Annapoorneshwari Temple is considered to be one of the most important religious sites for the people of Karnataka. It is said to be the ancient temple of Goddess Annapoorneshwari of this region. The name Annapoorneshwari means that one who provides food. According to history, this temple was built by Safe Agasthya. He was the first person to install the idol of the goddess in this temple. That’s why, later on this temple was renamed as Adi- Shaktyatmaka Shree Annapoorneshwari Temple. Step inside the temple to see the beautiful idol of the goddess Annapoorneshwari made of gold. Legend has it that whoever visits this temple is blessed that he will never go hungry in his life. With respect to this story, till date the temple authorities feed every visitor who comes in the temple’s premise. Hence, if you are visiting this temple you can be sure that you are not going to return back hungry. For accommodation, Boarding and lodging facility is provided by Temple trust. Donations are accepted. Ask the authorities about the details. Pooja timings: 6:30am – 9am, 11am – 2pm, 7pm – 9pm. 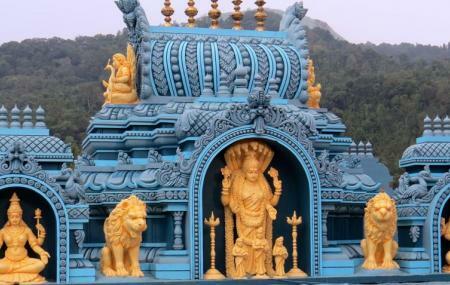 From Chikmagalur, hire a taxi or rent a car to reach the temple. How popular is Annapurneshwari Temple? People normally club together Sringeri Sharada Peetham and Kudremukh while planning their visit to Annapurneshwari Temple. Good devotional place but very crowded during afternoon since closed during noon. Good scenery can be seen from here. Management of crowd is good and transport to this place is good. Food as Prasada is given. Staff could be more kind and humble. Driving here is best with greenery around along the entire route. Serene nature. Cool environment. A divine place. A must visit. Do have a meal in the temple. It's a must. Meal served in temple is very delicious and believed that a person goes out of food in his whole life time. It's a beautiful place located in hill location. And great historical place. Free food provided for all the Pilgrims and we'll maintained place. I went with my whole family they're enjoyed lot. Quaint place, food was good. Temple staff were courteous. We got to see the diety up close for a good length of time. Accessibility for old and disabled could be improved by adding additional wheelchairs. Beautiful location , climate, lot of parking place . Few good decent lodges are there to stay. Only drawback is very few restuarant around temple.. but that is not problem for many since devotees will get 3 times food inside temple.